Travel brings in experiences that make working in a cubicle worthwhile. Most of us slog in mundane environs just for that one magical escapade after months. But then utopian destinations don’t come by easily and often. Not everyone has the wilful liberty to escape to sunkissed beaches and evergreen tropical forests to seek inspiration (for work or otherwise) or catch up on some much needed rejuvenation. And hence the need for vacation homes. Native places were mostly grandparent’s homes known for fun and frolicking. Most of these native places were ‘second homes’ in disguise, away from the chaos of the city, away from homework and closer to mango trees, starry skies, streams and simple living. With the advent of technology and nuclear families, these sweet summer vacation homes faded away in oblivion. Vacations were now the fancy getaways with a host of indoor entertainment. Gadgets were the new ‘toys’ and swings were mostly vacant. My first brush with vacation homes was when I dreamt of a garden home for myself. One with flowerbeds nestled on the window sills and fruit trees growing in my backyard, with spacious rooms with French windows and massive gardens in the front where I could pen travelogues, basking in the sun. And it happened. A vacation home nearly tailor-made to my dreams happened a few years ago, away from the din of the city and nestled near the Bharatpur bird sanctuary. My vacation mornings were now all about waking up to the calls of birds. Slowly and gradually I understood that vacation homes need not be ‘treehouses’ (A la Enid Blyton). They can be a perfect escape from pollution, yet have modern amenities and comforts, maintaining their natural surroundings. A one time investment and vacations for a lifetime, coupled with the feeling of ‘being at home’! This property of Tata Housing Prive fits that bill. Tata Prive is a Luxury home property in Khandala, with several state of the art villas, nestled in greenery and manicured gardens. For those looking for a vacation home to escape the hustle bustle of the city and live their dreams of spending vacations (without spending on hotels and looking up for discounts time and again!). It was a classic excuse: to pen down the pending travelogues of Indonesia, to gear up before wandering off to Kamrajar valley in the south and to catch up with Kala and spend some girlie time (read: long pending gossip) together! There are times when the frustrated writer in me cribs about the missing solace in the daily humdrum of our chaotic schedules. And gathering inspiration in cubicles or close quarters is err a far fetched dream for me. Often I long for a short escapade, away from the chaos, that guarantees the much required solitude for resting between trips( read recharging batteries of self and devices) and also the inspiration to pen down travelogues at leisure. I found mine last week 80 kms away from home. The day was spent by the pool in complete silence, with occasional walks amidst trees flanked with flower beds. At every bend there was a bench under bougainvillea bushes. The walks to the cosy library facing the pool were the most memorable! Not to forget the gargantuan fig tree we found, laden with wild figs! The best part was the complete silence that enveloped the place, perfect for a weekend getaway , away from pollution and noise! They also have a state of the art Club House with amenities likes a Juice Bar, Gymnasium, a Swimming pool, an indoor pool, Snooker table, a Spa and a conference hall. 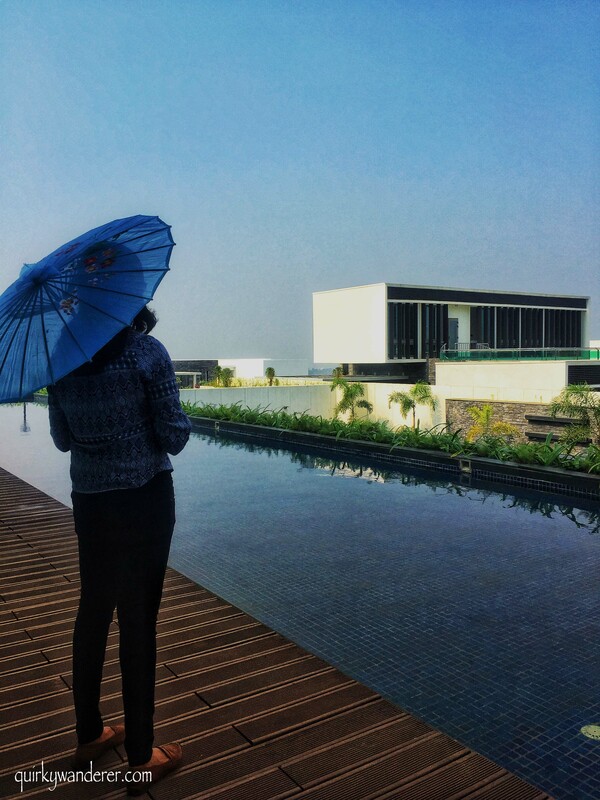 Disclaimer: I was invited by Tata Housing to their property Tata Prive in Lonavala. The idyllic weekend getaway soaked in luxury, beauty and serenity! The best part being it’s just so close to home yet faraway from the buzz of stress and pollution. Lovely captures! The place seems to be beautiful……. Love the deck by the poolside. Take a book from that library and sit by the pool and while away the time with those views. In your case write those inspirational travelogues. These pictures evoke a sense of calm and peace. Definitely worth your time! As someone who works a regular 9-to-5, I can definitely relate to your opening quote. This seriously looks like the best vacation home ever and I honestly can’t think of a better place to unwind and relax. (Look at that pool! And those library views!) I’d never wanna leave if I were you!!! Such a lovely property. I seems anyone would love to spend a vacation for a month or so in such a relaxing and tranquil house. I love the concept of vacation homes. More and more people are going for that ‘being at home’ feeling while vacationing. I loved the interiors of this property. This sure looks like home away from home. It makes me crave for my annual Lonavala escape too. wow Tata Prive seems like a perfect getaway place! Looks so calm and relaxing and so luxury! I would love to visit that place one day! Vacation homes are not too different from timeshare units (Club Mahindra/Sterling), but its really nice to go back to a place where there is a lot of calmness. In a world of AirBnB and variety, I think I could vacation at different places, but if people expect a certain predictability in a routine that’s closer for them, then this works like a charm. I love these vacation homes. I don’t know if i can make a prioritization to them. Interesting post. Those vacation homes look like such a beautiful escape! That would be a great place to escape from a busy and noisy city, sit down, and pen your thoughts and future blog posts. Great writing! Everything looks beautiful. So serene. I dig the fig tree too. Until 2 years ago I had only seen fig paste in Fig Newton cookies. But I spent a month in Cyprus. Fig trees in the backyard and we enjoyed fresh figs daily. Tasty! Gotta love that Tata Empire. It certainly brings a feeling of serenity! Vacation home is always a good idea for those craving for peace and calmness, and these houses you recommend are also suitable for beauty-lovers and natural-lovers! Thanks for your suggestion! The Tata Prive vactation homes seem to promise the best of both worlds. The tranquil serenity of nature and at the same time the modern conveniences and luxury of modern technology. They seem to be an ideal place to get away to and escape from the pressures of modern day living. A place for relaxation and rejuvenation. this house looks absolutely amazing! The pool, the interior design, the trees and the quiet all sound just like what I’d want out of a luxury vacation home! I have to say, I am impressed! The place looks super luxurious. Although I’d never think of investing in a vacation home for myself, I’d probably not use one, I’d rather travel to a new place everytime I need a vacation, but it may not be bad idea to maybe invest in one and put it up as a bnb for travellers! I used to work for Tatas before, I have high respect for them and I can see how great this idea and the quality of these homes is! That’s what I love about vacation homes too, away from pollution while having modern amenities. That fig tree looks so cool! That does look like a gorgeous place to stay. I’d be alternating between that lush looking pool and the library! Tata Housing Prive certainly looks like a great balance of modern amenities and natural surroundings. I love that they have such a quaint library, too! These seem so. Perfect with its clean, green environment. The club house to hit when you are bored or the pool just to Lounge around. To be honest, I doubt I would be able to work here. Everything about it is so relaxing and distracting. Pretty sure that is what you girls did on your day out.! Tata Housing Prive looks gorgeous. I love the way that it blends in with the natural surroundings and shows them off. I also love the library! I love a good library! The property looks amazing and perfect for a getaway! I love how much greenery there is, and the fact that there is a library. That’s not something you find very often!